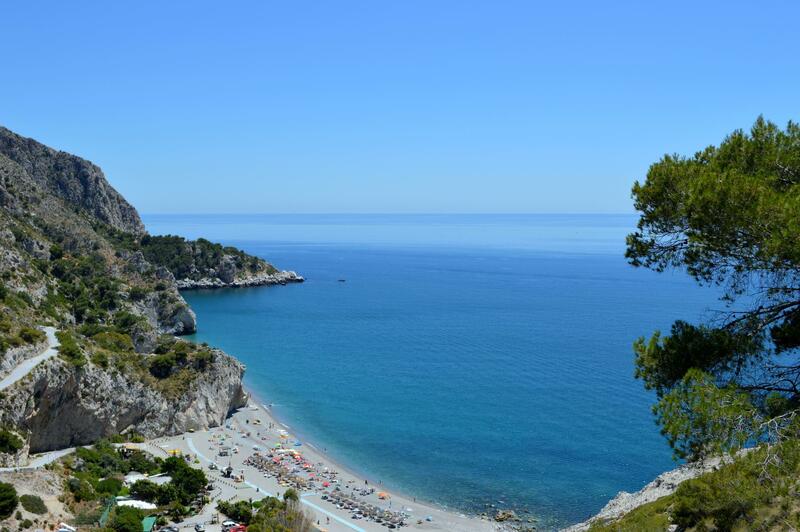 The beaches of El Cañuelo and Cantarrijan are amongst the nicest to be found on the coast. They are both situated right on the border between the Provinces of Granada and Malaga. Cantarrijan is the first cove on the Granada side. El Cañuelo beach sits on the Malaga side. There is a beautiful walk between the two. It takes you through several secluded coves and beaches. Ones that are normally only accessible by boat or via a longish swim. The walk itself is very straightforward, but you need to be in good physical condition and have a head for heights. There is no water along the way and its hot going in the summer months. Take plenty of water, a hat and sunscreen. Its always best to take a fully charged mobile phone and let someone know your planned route. If feeling unsure, there are numerous groups and hiking tours that can take you. That said, it is a walk we have done numerous times with children. The main path is relatively well marked, although there are numerous smaller tracks leading off in different directions along the way. Even if you do deviate off the route, you can easily backtrack and keep heading in the direction you should be going. There aren't too many places you can get lost in, just keep the sea on your right and keep going eastwards. Both beaches are situated in the Los Acantilados de Maro-Cerro Gordo natural park and vehicular access is restricted in the summer months. To get down to either beach, you need to park at the top and take a shuttle bus down. There are regular (every 5-10 minutes) buses to both El Cañuelo and Cantarrijan. You can also save yourself hiking back up the hill from Cantarrijan if you take the shuttle bus back (only in the summer months). The bus is a minor inconvenience, but one that assures that the beaches never get too crowded and remain in pristine condition. The snorkelling and diving are among the best in Andalucia. The walk leads past two 16th century watch towers which once formed part of a line of communications that stretched all the way along Spain’s southern seaboard and a stunning middle section of the trail that takes you along the spine of the Caleta ridge. This is the only section of the walk that may cause problems for people with vertigo. The walk starts in Playa El Cañuelo. You can start at the top, in the parking area and walk down the road, veering off to the left after one kilometre or so. Or you can take the bus/walk down to the beach and walk to the second cove. The route described here is the latter. There's a steep climb upwards, known as the Peñón del Fraile - as seen in the third picture. A bit further on and you'll see the beautiful Playa de los Doncellas - fourth picture. If looking for a secluded beach to yourself, this one is postcard perfect! This is the only section of the walk where care needs to be taken. You are now on the Caleta ridge and should have the tower - Torre de Caleta - in your sights. Keep heading towards the tower. The path becomes a lot easier to follow near the tower and is marked with blue dots that have been spray-painted on the rocks. Keep following this path. There's a fork where you can walk rightwards towards the tower. Its only 200m and well worth the views. Retrace your footsteps and get back onto the path afterwards. The walk takes you through some spectacular countryside and through the heart of the Los Acantilados de Maro-Cerro Gordo natural park. As you walk through a thick pine forest you'll start catching a glimpse through the trees of your final destination.......the beautiful Playa de Cantarrijan. Stop here for a swim and a bite to eat. The restaurant is reasonably priced and serves some great food. You can walk back up the road from here or during the summer months take the shuttle bus back up. Be more intrepid. Pack up that beach towel and head for the hills. What are the top 10 things to do in the Alpujarras?